Learning objective: This workshop will outline the basic principles of extracorporeal life support made easy by key-experts in the field. 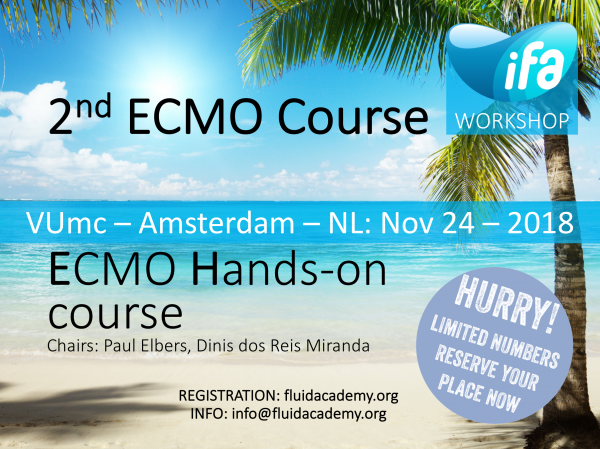 During the course delegates will gain a good understanding of ECMO in the following areas: Theoretical concepts, basic physiology and pathophysiology, cardiac and respiratory support and monitoring, alarm settings and monitoring, role of cardiac ultrasound during ECMO, newest technologies, circuits and devices, practical hands-on sessions and simulations. Delegates will have the opportunity to have hands-on training in small break-out groups with ECMO equipment. Delegates will experience practicing insertion of cannulas on a mannekin, circuit surveillance, monitoring, alarm settings, simulations and trouble-shooting. This course is for you if you work in intensive care medicine either as a consultant or trainee and already have at least some experience with ECMO/ECLS. Cannulation experience is not required as this will be the main focus of this course.